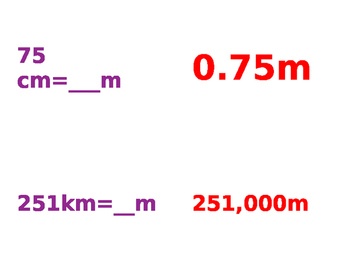 This download is a great way to check for understanding when completing a unit on converting metric units. It includes task cards in the areas of converting liquid measurements, weight, and length. 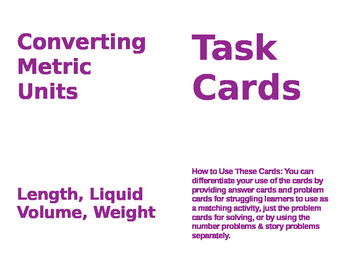 The task cards include number problems and real-world story problem cards. You can use this activity as a center game or as individualized or small group extra practice for your students. In my classroom I have used the task cards in multiple ways. For my students that need the extra assistance I give them the answer cards & the problem cards mixed up. I have them match the correct answers instead of solving them. For students that struggle with just story problems, I may give their group the story problem task cards. Anyway you decide to use these cards they are a great addition to your math materials.